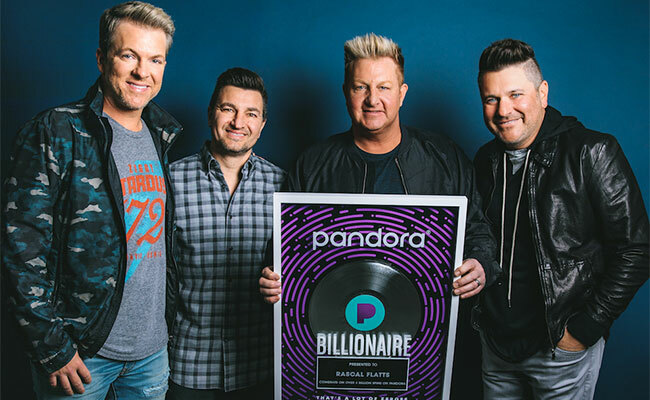 Superstar vocal group Rascal Flatts were surprised during a visit to Pandora’s New York office on Tuesday (Mar 19th), when they were presented with a “Billionaire Plaque.” The milestone plaque marks the trio receiving over four billion streams on Pandora. One band. Ten albums. Seventeen No. 1 hits. Over 27 million records. Time and success have only put Rascal Flatts closer to their core with expert musicianship, razor-sharp vocals and songs that have shaped lives, loves and the genre of country music itself. The trio’s new single “Back To Life” is currently ascending at country radio and follows back-to-back chart-topping singles “Yours If You Want It” as well as “I Like The Sound Of That” (Big Machine Records). Rascal Flatts recently dropped a four-song EP, Jukebox as a surprise for fans, featuring special spins on their most-loved songs. The group has also earned over 40 trophies from the ACA, ACM, AMA, CMA, People’s Choice and more, also making them the most awarded country group of the past decade. Known as one of the hottest-selling touring acts in any genre with over ten million tickets sold, the trio just announced their stacked headlining Summer Playlist Tour, kicking off at two thirds of the group’s home state of Ohio in Cincinnati on May 16th.